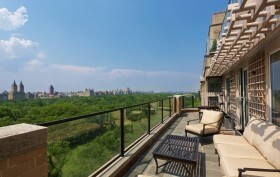 Okay, so this immaculate penthouse perched high atop 875 Fifth Avenue really isn’t a tree house, but given its miles of treetop views we could be forgiven for taking a few liberties with the term. Packed within Manhattan’s roughly 520 million square feet are some of the most amazing residences in the world, many of them boasting gorgeous interiors but not much in the way of outdoor space. It’s a concession one must make for living in the most vibrant city in the world. But every once in a while, something special comes along.